In this beginner tax preparer course, you will learn to prepare tax returns and research tax issues for most Form 1040 individual, non-business taxpayers; plus the basics of Schedule C/self-employed tax returns. No prior tax or accounting experience or knowledge required. With all materials at your fingertips. Your questions are answered quickly to help you succeed. Written in plain English, with real-world examples to apply what you learn. Immediate grading with feedback on all assignments and exams. Learn without software to avoid costly and embarrassing mistakes. Interact with instructors and other students in our student forums. For a summary of how you are moving along in your course. 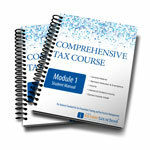 FREE Annual Federal Tax Refresher Course to qualify for voluntary IRS Annual Filing Season Program. Attractive Certificate of Completion to display in your office. Installment payment plans and upgrade options available. Start your own home-based tax business without franchise fees or royalties! Guide available for $100. The Chartered Tax Professional (CTP®) certificate program will enable you to prepare both basic and complex individual Form 1040 and small business corporation Form 1120 & 1120S and partnership Form 1065 tax returns. No prior tax or accounting knowledge is required, and minimal computer skills. The CTP® program covers all topics on the IRS Enrolled Agent (EA) exam — the highest designation in the tax preparation industry — and will help you to pass the EA exam after taking an EA exam review. Annual CE requirement of 15 hours. 300 Hours Experience Requirement. The CTC® certificate program will enable you to prepare both individual Form 1040 and small business corporation Form 1120 & 1120S and partnership Form 1065 tax returns. Annual CE requirement of 15 hours. 200 Hours Experience Requirement. The CTA® certificate program will enable you to learn to prepare most individual Form 1040 tax returns, including more complex situations. Annual CE requirement of 15 hours. 100 Hours Experience Requirement. Maryland How to become registered. New York How to become registered. Enrolled Agents status is the highest credential the IRS awards. Enroll in our CTP Certificate Program. Complete an EA Exam Review with Exam Matrix. Pass the IRS Special Enrollment Exam (SEE).